Picture a dark night in the wilderness among friends, all huddled around a campsite fire, roasting marshmallows above the crackle of the flame. Someone suggests telling ghost tales, eliciting reactions of enchanted suspense. 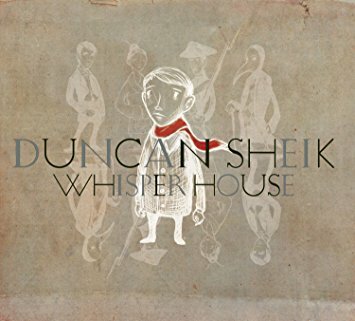 Such is the mood imparted on Whisper House, the latest album by singer/songwriter Duncan Sheik. Drawing on attributes of musical theatre and linear, narrative storytelling, Sheik is at turns evocative and engaging, precociously rendering ten songs like chapters in a fantasy book. Set amid World-War-II-era New England, the storyline centers on the doleful imaginings of a young boy, Christopher, whose father has perished in battle and whose mentally unfit mother has shipped him off to live with his aunt. Christopher soon suspects that his new home—as fate would have it, a lighthouse—is haunted by ghosts. The tracks that comprise Whisper House are the voices of these phantoms, which instill this already crestfallen boy with dread and self-doubt. Of course, none of this would make much difference if the songs weren’t any good. Fortunately, the compositions are equally progressive and beguiling—underscoring lyrical themes of mortality and irrational fears—making for a rich, thoroughly rewarding album. On the folksy opener, “It’s Better To Be Dead,” Sheik affects a vocal reminiscent of David Bowie circa Hunky Dory, assuming a stately air that sets a suitably ominous tone. He adds whimsical, melodic flourishes to tracks like “The Tale of Solomon Snell” and “Earthbound Starlight,” contrasting such austerity with more illusory, lighthearted orchestrations. Complementing Sheik’s foreboding, sullen vibe is vocalist Holly Brook, who renders an ethereal yet intimate presence throughout, gorgeously so on “How It Feels” and “Earthbound Starlight,” as well as on “And Now We Sing,” which finds her singing lead. Like any good story, Whisper House is imaginative and thematically sound. In translating those qualities to music, Duncan Sheik renders an inspiring work, one which yields enjoyment above and beyond its underlying premise.